William’s family came from the north-west of England. His grandfather, Christopher Sutton, was a police constable from Lancaster and his grandmother Sarah was born in Ulverston in the Lake District. They lived in Preston and had at least seven children. William’s father, John Thomas Sutton, was born in 1876. By the age of 15 he was working as a cotton weaver, very possibly in the Lancashire cotton mills. In late 1897, he married another cotton weaver, Jessie Henderson, born 1876 in Carlisle. In 1899 they had a son, William. By 1901 John had become an iron foundry labourer and he was listed on the 1901 census living with Jessie and two-year-old William in Preston, at St Andrew’s Road. By 1911, the family had moved to a house with four rooms in St Cuthbert’s Road and John had become a chauffeur for the Chief of Police in Lancashire, Charles Villiers Ibbetson. At some point between the 1911 census and 1914, the Suttons moved to Datchet where another daughter, Bett (Ellen Elizabeth), was born in July 1914. They were living at Lawn Cottages on Horton Road. 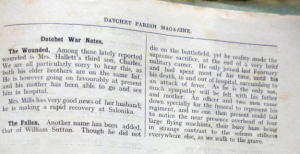 It’s very likely that they moved to Datchet because Charles Villiers Ibbetson, the former Chief of Police, moved here when he retired. 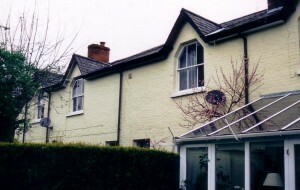 He lived at The Cedars on Horton Road, next door to Lawn Cottages. This suggests that John continued to work as a chauffeur for the Ibbetsons after they moved to Datchet. Lawn Cottages, left, were originally built around 1870 by John and Ann Crake, owners of The Lawn, as housing for their staff. After their deaths (John in 1859 and Ann in 1900) their daughter Annie Alice (who married George Knox Morice) and their son Bernard owned the house and estate. It was sold after George’s death in 1928. It is quite possible that the Ibbetsons could have rented one of the cottages for their staff. See Datchet History for more information about The Lawn. John had signed up by May 1915. He became Private Sutton M2/077912 in the Military Transport section of the Royal Army Services Corps where his experience with motor vehicles was no doubt invaluable. After he left school, William (known as Willie or Will) became a motor fitter. Had he perhaps been inspired by his father’s work with cars? When he was old enough, William signed up too. He enlisted at the recruiting office in Slough on 6 September 1916 for the duration of the war. He was 17 years old, 5’4” tall, and weighed just over 8st. Initially he joined the Army Reserves. William’s military records show that on 15 March 1917, aged 18 years and 1 month, he was posted to the Royal Army Services Corps Military Transport Reserve Depot at Grove Park in Lewisham. He was Private Sutton M/301073 of 274 Military Transport Company RASC, part of the 42nd (East Lancashire) Division. The Company remained in the UK as a driver training company. 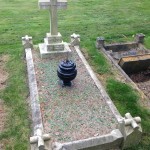 William was buried in Datchet Cemetery. William’s father, John, served until the end of the war and was awarded the Victory and British War Medals. He was listed on the 1918 Absent Voters list at 5 Penn Road so the family perhaps had to vacate their home at Lawn Cottages after Charles Villiers Ibbetson’s death in 1918. 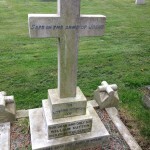 He, too, is buried in Datchet Cemetery. Both John and William are both recorded on Datchet’s War Roll and William is remembered on the War Memorial. Their neighbour at Lawn Cottages, Ernest Alfred Clifford, is also remembered on Datchet’s War Memorial.